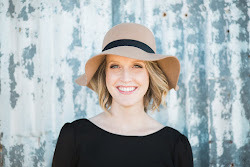 This was my third 10x10 wardrobe challenge to participate in, and it's been my favorite so far. I had a bit more time to choose my 10 pieces which helped! 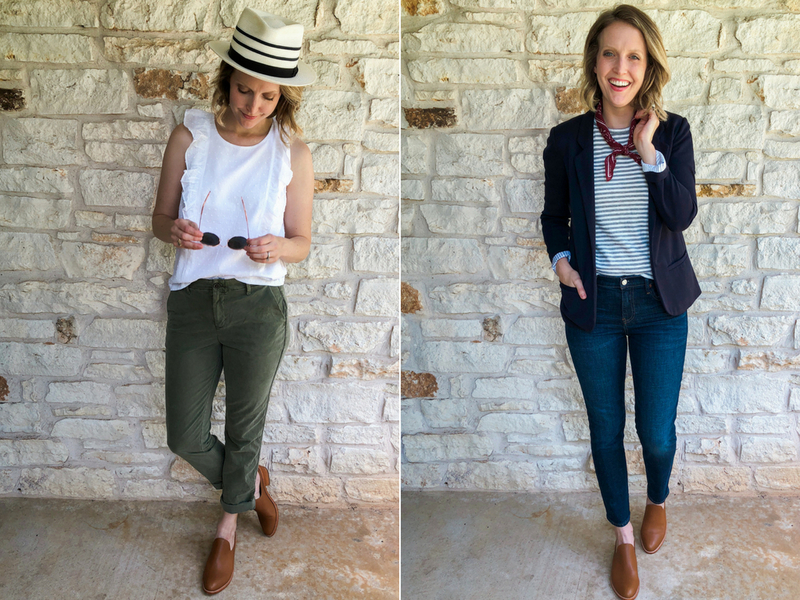 Lee Vosburgh hosts the challenge, and the goal is to choose 10 items of clothing (including shoes) and style them over 10 days to create 10 outfits. 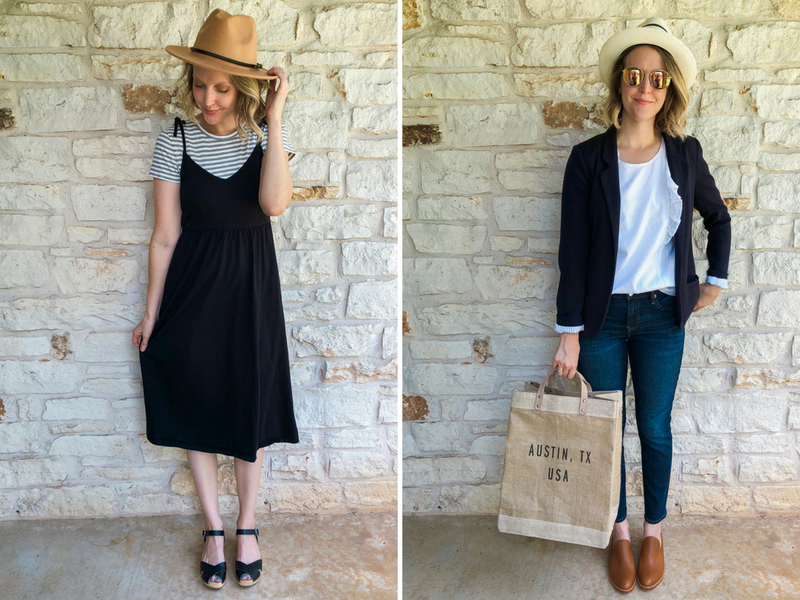 Read on for tips on creating your own capsule wardrobe and links to the pieces I wore! 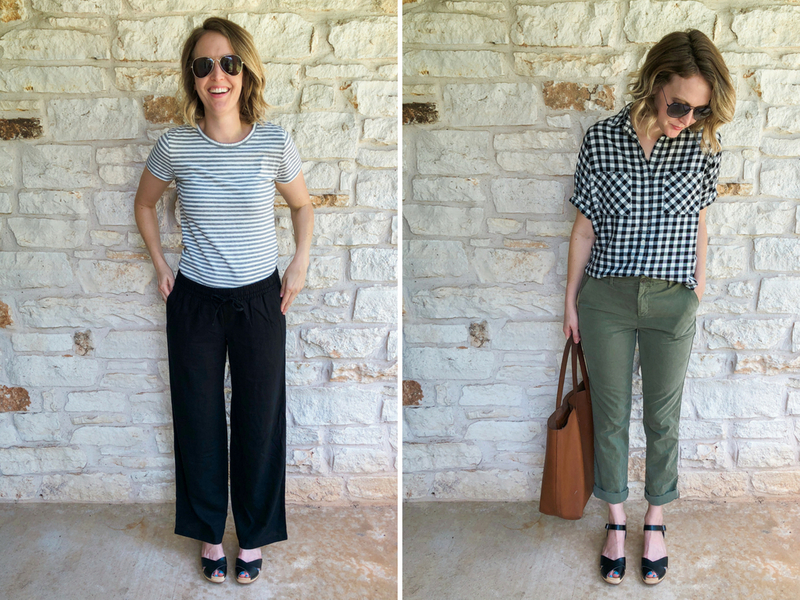 I'm always faced with the challenge of choosing items I can wear on the weekend while wrangling kids but also outfits I can wear to work! I wanted to add in some color but I went with old faithful...neutrals. 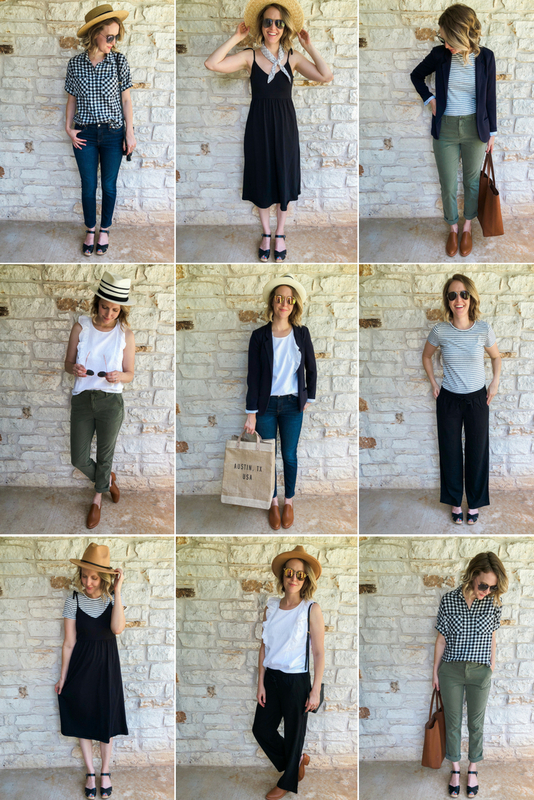 I'm not going to lie and say I wore every one of these outfits during the 10 days because life happened and we were traveling on the weekend. As a kid I used to batch shop a couple of times a year with my mom. By batch shop I mean buy 5-6 outfits that would all mix and match together plus coordinating shoes. 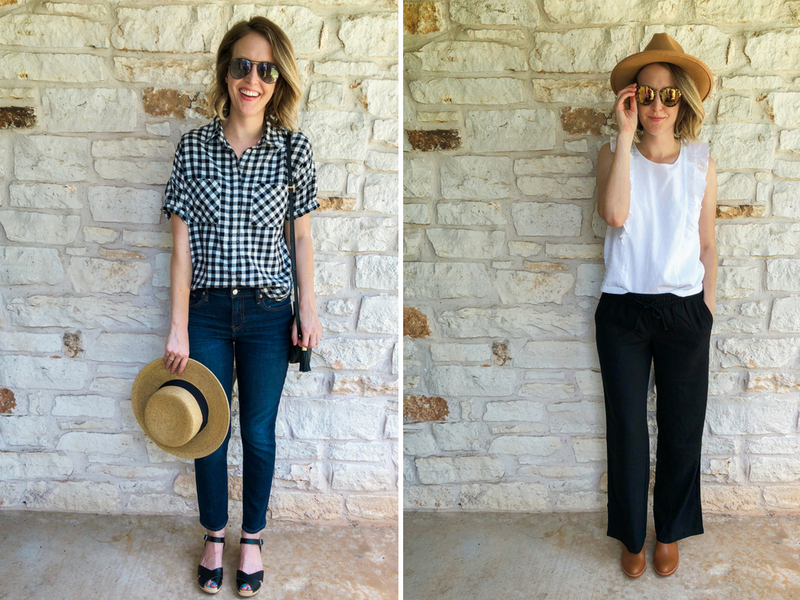 Basically I was raised creating a capsule wardrobe...haha! I lived in the country with only a Walmart so going to a clothing store on the weekend or weeknight wasn't a normal thing. It was a big event to go shopping in the city, and we would go to San Antonio and spend the ENTIRE day shopping. I miss that type of shopping. Now I pick an item here and there, and I find that I can't create as many outfits because my pieces are a bit random. 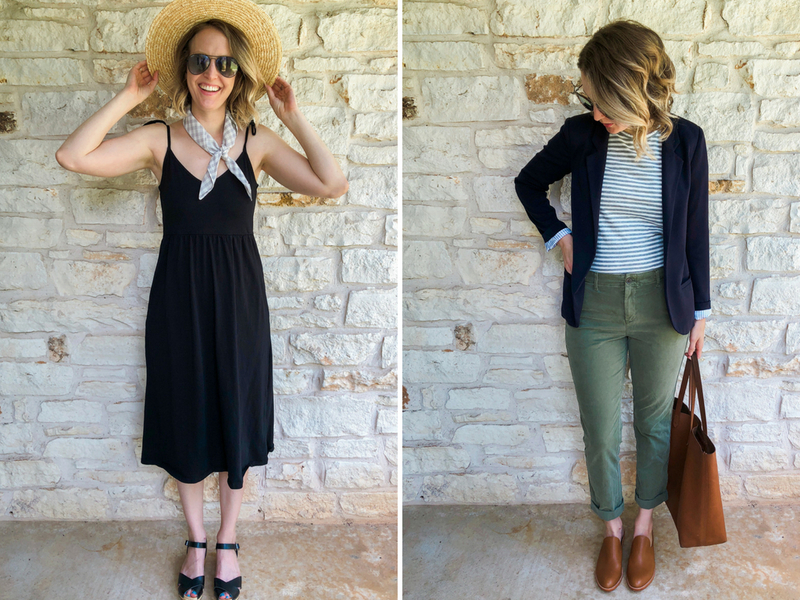 How often do you lay out your clothes and mix and match them finding different ways to style them? When I plan for the 10x10 challenge I actually draw my outfits out on a piece of paper. I also spend time mixing and matching them in front of my full length mirror. It's not necessarily something I love to do, but it makes getting dressed so much easier and ultimately can lead to you making better purchase decisions. After thirty minutes I can usually identify what type of item I'm missing that would complete a great capsule wardrobe. Now, I will say that after the challenge ends I don't stick to a strict capsule wardrobe because I like having options. It's tax free weekend in Texas and I'm itching to shop, but I have everything I need and a credit card to pay off so I'm going to try my hardest to stay AWAY from the mall! If there's anything I learned from this challenge, it's that I don't need a ton of clothes to have a versatile wardrobe. Scroll down to the bottom of this post for links to all my items! See my Winter 10x10 recap and Spring 10x10 recap!